2 mins to the 2 mins to the QUE UE UE U E EE EE E N EN EN E S NS NS N WA WA WA W Y QUEENSWAY ex ex e ecutive xecutive x executive SU SU SU S ITES TES SUITES close to pubs & close to pubs & RESTOS ESTOS RESTOS H H e left meetings behind - downtown was only A few blocks away! THE SURPRISING DOWNTOWN OTTAWA HOTEL YOU MIGHT HAVE MISSED. 377 O'CONNOR STREET, OTTAWA, ONTARIO 1-800-465-7275 WWW.VICTORIAPARK.COM DOWNTOWN OTTAWA 435 ALBERT STREET 613.238.8858 RESERVATIONS 800.267.6644 ALBERTATBAY.COM The moment.You know it. 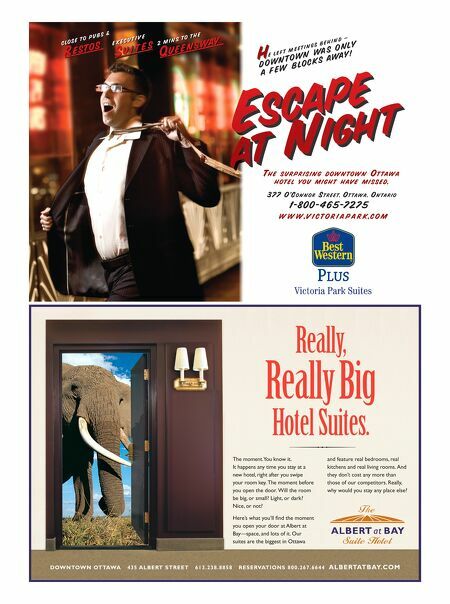 It happens any time you stay at a new hotel, right after you swipe your room key. The moment before you open the door. Will the room be big, or small? Light, or dark? Nice, or not? Here's what you'll nd the moment you open your door at Albert at Bay—space, and lots of it. Our suites are the biggest in Ottawa and feature real bedrooms, real kitchens and real living rooms. And they don't cost any more than those of our competitors. Really, why would you stay any place else? Really, Really Big Hotel Suites. MSVS: Shifting into the final gear? 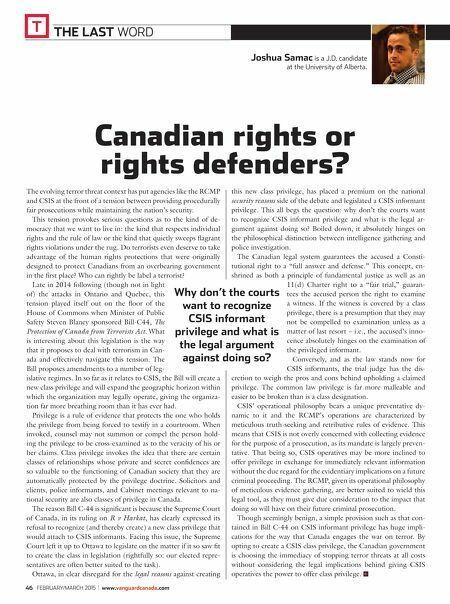 Canadian rights or rights defenders?